In just one of the many nutty scenarios set to befall him, the Roman centurion knelt and prayed before the large bronze Atlas statue outside Rockefeller Center. 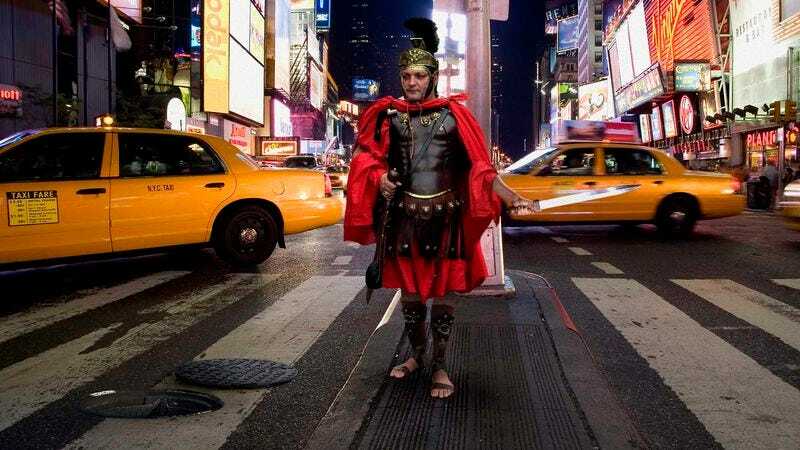 NEW YORK—Standing mystified in a crowded intersection, Verus Attius Glabrio, a Roman centurion who emerged from a manhole in the middle of New York’s Time Square, is in for a wacky adventure, sources confirmed Wednesday. Reports stated that Glabrio, a highly decorated military officer from 55 A.D., crawled out of the sewer opening at approximately 8:35 p.m. clad in full Roman Imperial battle armor, immediately causing motorists to swerve, slam on their brakes, scream vulgar remarks, and make obscene hand gestures in his direction. According to eyewitness accounts, the Roman soldier spent the next several minutes asking uncooperative passersby for directions to Corsica, stressing that he needed to return to finish the great war and secure victory for the Empire. Despite his best efforts, however, Glabrio reportedly garnered little attention from anyone aside from a family of tourists who posed for a photo with the baffled Roman infantry commander in front of M&M’s World, and an 8-year-old boy who looked up, mouth agape, from the Spartan-themed comic book he was reading. “If you cannot accompany me, won’t someone at least tell me where I may find this man—surely he must be your leader,” Glabrio then added, gesturing to a giant billboard ad featuring an image of Puff Daddy. After he was seen very tentatively stepping into a subway train, the centurion was reportedly later spotted at the Metropolitan Museum of Art, growing wide-eyed upon glimpsing the marble busts of political figures he claimed to know personally while passing through the museum’s Greek and Roman Art exhibit. According to sources, Glabrio became involved in a heated altercation with two security guards after he attempted to pick up several of the “clearly looted imperial riches” and vowed to return them to Rome. The situation, onlookers told reporters, was defused when Rebecca Huntley, a meek doctoral student of European history who would unwittingly find her own life turned upside down by this unusual yet strangely attractive man, intervened on the Roman centurion’s behalf, explaining that he was not from around here and discouraging museum workers from calling the police. “Wait, step back, my lady, I will protect you!” Glabrio then shouted before leaping and tackling a life-size statue of a lion. The Roman centurion and Huntley reportedly spent the rest of the evening bonding over several slices of pizza, a glass of wine Glabrio tossed back in one deep gulp, and an awkward but endearing hour of recreational ice skating. Sources confirmed that the night concluded with the pair discussing the breathtaking views of the Adriatic Ocean from the cliffs of Polignano a Mare in Italy, where, in a coincidental twist of fate, the young woman spent time studying abroad and Glabrio was born and raised. At press time, sources confirmed that Glabrio was completely clueless to the fact that his rival general from Corsica as well as several of his foe’s underlings were at that very moment beginning to awaken in the middle of Central Park.